The TS-831XU 8-Bay NAS Enclosure from QNAP is designed to be used for backup, synchronization, remote access, and home entertainment. Its eight drive bays support 2.5" and 3.5" SATA III (6 Gb/s) hard drives and SSDs. Many apps are available for free download from the App Center, including Notes Station, Qfiling, QmailAgent, and Qcontactz. The TS-831XU runs the QTS 4.3 operating system, a browser-based operating system which helps to simplify managing your QNAP NAS. Its CPU is a quad-core 1.7 GHz ARM Cortex A15 fabricated by Annapurna Labs, and its 4GB of DDR3 RAM allows frequently used files and applications to be quickly accessed. The NAS offers maximum read and write speeds of 1227 MB/s and 775 MB/s respectively, as well as sequential read and write transfer speeds of 340 MB/s and 353 MB/s respectively with AES 256-bit full NAS volume encryption. Four USB 3.0 ports allow the enclosure to be connected to your Windows, Mac, or Linux/UNIX system. Network connectivity is achieved via two integrated Gigabit RJ45 LAN Ethernet and two 10GbE SFP+ LAN ports, with link aggregation to increase the total data transmission potential. Failover and dual IP are also supported to ensure continuous system operations, and data may also be made remotely available through the free iOS and Android applications. The TS-831XU is engineered for quiet operation, generating 41.3 dBA at low speeds. It operates on 100-240 VAC power and includes two Ethernet cables, flathead screws for 3.5" and 2.5" drives, and a power cord. Equipped with an Annapurna Labs Alpine AL-314 quad-core 1.7 GHz Cortex-A15 processor, 4GB DDR3 RAM (upgradable to 16GB), dual Gigabit LAN ports, and SATA 6 Gb/s, the TS-831XU is a high-performance NAS for home and workgroups, providing performance of up to 1227 MB/s read & 775 MB/s write throughput. The TS-831XU's enhanced hardware-based encryption and decryption engine provides 340 MB/s read and 353 MB/s write speeds with AES 256-bit full NAS volume encryption, boosting system performance & security while helping to ensure the safety of sensitive personal data stored in the NAS. Two integrated Gigabit Ethernet ports and two 10GbE SFP+ ports enable the TS-831XU to fully support 10GbE high-speed networks, while an extra PCIe slot allows for the installation of a 10GbE SFP+ NIC for flexible high-speed network deployment. The TS-831XU supports SSD caching to greatly boost the IOPS performance of storage volumes to increase operational efficiency. It is perfect for improving the overall workflow of IOPS-demanding applications and allows the best of both cost and performance by combining SSDs with HDDs. The intuitive user interface of QTS makes your NAS experience smarter and smoother. Its modern flat design streamlines loading times, while the intelligent desktop allows you to find desired functions quickly, create desktop shortcuts or group shortcuts, monitor important system information on a real-time basis, and open multiple application windows to run multiple tasks concurrently, bringing greater working efficiency. The TS-831XU supports port-trunking, enabling administrators to set up link aggregation to help increase total data transmission potential. Failover and dual IP are also supported to help ensure continuous system operations. The business-ready TS-831XU is designed to provide 24/7 operations and services. The support for comprehensive RAID configurations and hot-swapping allows for replacing hard drives without service interruption. QNAP's RAID recovery technology also helps if any healthy drives are accidentally removed from a degraded RAID volume. The system can be recovered by reinserting the wrongly removed hard drives so the data can still be accessible. The TS-831XU delivers high reliability and efficiency with support for multiple port-trunking modes including failover support. QmailAgent is an online email client that helps you manage multiple email accounts, allowing you to access all of your emails and to easily switch between different accounts. It provides complete functionality for composing, reading, and organizing emails. You can even attach files, photos, and documents from the TS-831XU when composing emails. iOS and Android users can use the QmailClient app to quickly check multiple email accounts with mobile devices, and to browse & send emails using the QmailAgent on their TS-831XU. You can use QmailAgent together with Qsirch, which supports searching through the .eml files stored on the TS-831XU, to make searching through and managing massive numbers of emails much easier. Qcontactz with the high-capacity TS-831XU helps you centrally store and manage contact information for colleagues, business partners, families, and friends. Other features include importing from Google accounts, importing/exporting CSV or vCARD 3.0 files, automatic identification of frequently used contacts, encryption for sensitive/confidential contact information, smart searching, and more. Qcontactz offers snapshot backups that enable you to revert to a previous version of your contacts list according to your needs. A companion app for Android phones and iPhone is also available for easy access to contacts. Qcontactz can also be used with QmailAgent to create email workflow environments, as well as with Qsirch to find specific contacts when needed. Qfiling helps automate file organization for sorting files spread through multiple folders, helping to reduce the time needed for finding important files. You can categorize files and determine filing conditions, and schedule filing tasks to be carried out periodically. The Recipe feature allows you to save frequently used filing conditions as an "exclusive recipe" so that the next Qfiling task can be run with just one click using the recipe. Qsync utility turns your TS-831XU into a safe, high-capacity data center for file synchronization. Any file uploaded to the TS-831XU will be made available for all linked devices, such as computers, laptops, or mobile devices. It is especially useful for frequent travelers who need to manage files and always have the most up-to-date files on different devices. Qsync provides multiple ways for file synchronization and group file sharing, greatly enhancing the flexibility of team projects and collaboration. Notes Station helps organize notes for your personal and working life. You can easily edit text, insert images/files from the NAS, fine-tune images with the image-editing tool, create sharing links to share notes, backup/restore your notes with snapshots, and ensure privacy with password protection and encryption. You can also invite people to collaborate on notes for greater teamwork. Notes Station provides a safe and convenient way of taking notes that are fully under your control on your TS-831XU's private cloud. The TS-831XU is a comprehensive centralized backup center for multiple files. You can use QNAP NetBak Replicator to back up files on Windows to the TS-831XU, or use Time Machine for Mac data backup. A wide range of third-party backup software (such as Acronis True Image and Symantec Backup Exec) are also supported to facilitate system backup and restoration. Hybrid Backup Sync consolidates backup, restoration, and synchronization functions (using RTRR, rsync, FTP, CIFS/SMB) into a single app for easily transferring data to local, remote, and cloud storage spaces as a comprehensive data storage and disaster recovery plan. Supported cloud services include Amazon Glacier, Azure Storage, Google Cloud Storage, Google Drive, Microsoft OneDrive, Dropbox, Amazon Drive, Yandex Disk, Box, and Amazon S3 / OpenStack Swift / WebDAV compatible services. Hybrid Backup Sync supports multi-version backup, flexible job scheduling, and file compression to save storage space, and more. In open network environments, business data may be exposed in a potential hack. The TS-831XU provides numerous security options, such as encrypted access, IP blocking, 2-step verification, and more. Administrators can also control the access rights of each user to different folders, preventing unauthorized access to important files. The TS-831XU supports AES 256-bit encryption, preventing sensitive business data from unauthorized access and breach even if the hard drives or the entire system were stolen. The TS-831XU supports SMB/CIFS, NFS, and AFP protocols for file sharing across Windows, Mac, Linux/UNIX networks. Data, logs, and ISO images of CDs and DVDs can be centrally stored on the TS-831XU and protected by an integrated antivirus solution. The Windows AD and LDAP services enable system administrators to configure user permissions by using an existing Windows AD server, LDAP server, or built-in LDAP service. The TS-831XU supports SAMBA v4 and can act as a Windows domain controller to manage privilege settings. File Station brings conventional desktop-style file operations to web browsers, allowing you to upload, download, and manage files on your TS-831XU wherever there is an Internet connection. Supporting file extraction, folder creation, and smart search for files and folders, File Station also allows you to easily share files via unique URLs protected with reliable security features, SSL, and password options. You can even directly browse and transfer files between the TS-831XU and public cloud services like Google Drive, Dropbox, Microsoft OneDrive, Box, Yandex Disk, and Amazon Drive, open office files directly with a Google Chrome office extension, and also view your files on Google Docs or Office Online. QNAP Container Station exclusively integrates LXC and Docker lightweight virtualization technologies, allowing you to operate multiple isolated Linux systems on the TS-831XU as well as download apps from the built-in Docker Hub Registry. It supports container import/export and permission settings, and features an informative dashboard and flexible user interface for you to manage multiple containers. Moreover, Container Station provides an ideal platform with countless hands-on containerized apps for developers to easily apply, rapidly develop, and conveniently deploy IoT applications. Simply search "IoT" in Container Station, acquire proper containers, and design your own IoT stack with "QIoT Containers" for diverse IoT applications. With the QVPN app that integrates settings for VPN server and VPN client, the TS-831XU can be used as a VPN server with L2TP/IPsec, OpenVPN, and PPTP support, allowing you to securely access data shared within private local networks. It can also be used as a VPN Client to connect to other VPN servers (connecting multiple servers at the same time is possible) or virtual private networks through PPTP and OpenVPN for secure data transmission. You can connect devices to your NAS and the VPN server at home to access data on the LAN. Via VPN Client on your NAS, for example, you can connect to VPN servers in foreign countries for accessing regionally restricted services. In contrast to the limited storage space of public cloud services and the security concerns associated with them, the large-capacity private cloud established by the TS-831XU gives you full control over how your data is used and transmitted. The myQNAPcloud service allows remote access to files stored on the TS-831XU, allowing you to play & share multimedia from the TS-831XU or to conveniently check the system status from almost anywhere. Surveillance Station is a professional network surveillance Video Management System (VMS) that offers a user-friendly management interface, over 3000 compatible IP camera models, and expandable IP camera channel licenses. It supports real-time monitoring, video & audio recording, and playback with a wide range of customizable settings. You can also install the Vmobile app on your iOS or Android devices to manage the monitored channels anytime and anywhere to safeguard your office environment, or install the Vcam mobile app to turn your device into a network camera to instantly record to your TS-831XU. The TS-831XU offers two free IP camera channels and you can expand up to 30 channels by purchasing additional licenses. The TS-831XU scalable design supports online capacity expansion by connecting two QNAP expansion enclosures for storing rapidly growing data, ideal for storage-intensive applications such as video surveillance, data archiving, TV broadcast storage, and more. 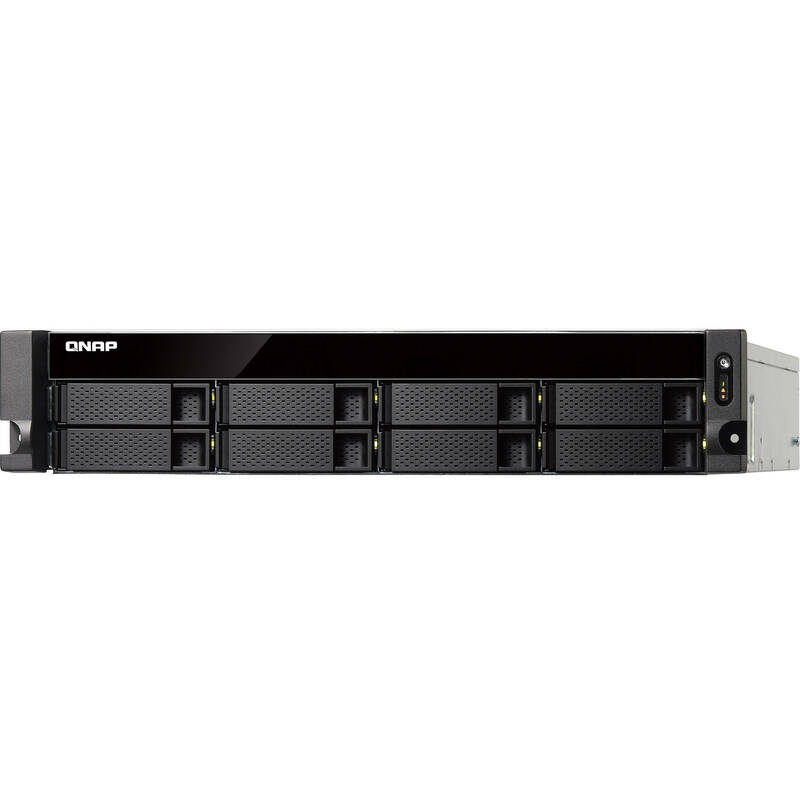 You can gradually expand the TS-831XU's storage to up to 28 drives on demand, and use the QTS Storage Manager to easily handle the NAS capacity expansion and storage expansion enclosure management. With the support of QJBOD Express (JBOD enclosures roaming), you can connect a large-capacity QNAP expansion enclosure to the TS-831XU, and migrate data to another NAS through the JBOD enclosure without network connectivity. Note: RAID groups of storage pools cannot cross multiple enclosures. Photo Station makes photo sharing simple, and lets you designate your own access right controls. Simply upload your photos to the TS-831XU to create & organize your photo albums through a web browser, and share with your family and friends through social networking sites such as Facebook, Google+, Twitter, and Pinterest. With the Qfile and Qphoto mobile apps (for iOS and Android), you can also instantly upload your new photos from your mobile device to the TS-831XU. Music Station helps categorize your music collection and displays album covers to easily organize your personal playlists. Through the Music Station web player, you can enjoy your music virtually anytime and anywhere with a few clicks. Thousands of local and global online Internet radio programs are also built into the Music Station for you to enjoy. Use your TS-831XU as a multi-zone multimedia system to fill every corner of your house with your choice of media. You can centrally manage and stream photos, music, and videos from the TS-831XU to different rooms from a single device using Bluetooth & USB devices connected to the TS-831XU (music streaming only), DLNA, Apple TV, and Chromecast. Every room member in different zones can enjoy the convenience and simplicity for media playback and multimedia storage. The TS-831XU is also a download center for high-speed BT, Magnet, PT (Private Trackers), FTP/FTPS, and HTTP/HTTPS downloads, and supports loading RSS feeds. After you have finished setting your download tasks, you can turn off your computer and the TS-831XU will silently finish downloading them. By installing the Qget app in your mobile devices, you can easily search download sources, download contents to the NAS, and manage download tasks on mobile devices from anywhere. The TS-831XU is your private cloud storage that virtually enlarges the capacity of your mobile devices. Qfile allows you to access, upload, download, manage, and share NAS files as if you are carrying all of them in your pocket. If Qfile is installed on an iOS device, users can also browse videos & photos stored on the TS-831XU and play via Apple TV. Qmanager lets you monitor & manage the TS-831XU remotely and efficiently without turning on your PC. You can enjoy and share music, photos, and videos on the TS-831XU anywhere and anytime with Qmusic, Qphoto, and Qvideo apps. The built-in App Center provides various install-on-demand apps developed by QNAP and third-party developers, including tools for backup/sync, business, content management, communications, download, entertainment, and much more. It is also a centralized location for managing & updating installed apps. The TS-831XU offers energy-saving features such as hard disk standby, scheduled power on/off, and Wake-on-LAN. Should you encounter technical problems or have suggestions for improving QNAP products, you can directly contact QNAP's support staff using the Helpdesk app. This app allows you to directly send feedback, questions, and technical support requests to the support team. Helpdesk features remote support, allowing the support team to help you quickly resolve issues by remotely connecting to your NAS over a secure 256-bit SSL encrypted connection. Helpdesk also provides a range of online resources, including online tutorials, frequently asked questions, compatibility lists, and the QNAP Helpdesk Knowledgebase. Whether you are a new or experienced NAS user, you can quickly find answers to your questions by browsing through these resources. Note: Response times may vary depending on your location, time zones, and local holidays. Web server allows numerous websites built on the same server. Administrators can manage up to 32 websites on one Turbo NAS with reduced IT cost. FTP server allows you to share large files, with user-defined settings including bandwidth limitation, number of connections, and write-only permissions. The RADIUS server provides centralized authorization management for computers to connect and use a network service. VPN server provides an easy way for IT administrators to build up a secure private network and allows the staff to log on from outside the office and securely access business resources such as files and Internet connections. Printer server sends remote printing requests over the Internet (maximum three USB printers), and supports IPP (Internet Printing Protocol), Samba, print job management, and Bonjour printing for Mac OS X.
Surveillance Station allows you to connect and manage multiple IP cameras remotely. It includes real-time monitoring, video recording, playback, and event notifications. For dual-DIMM configurations, a pair of identical DDR3 RAM modules must be used.